I think the Apple pundits are short sighted in thinking that Apple is falling victim to the same mistakes it made in the Mac vs. PC era. 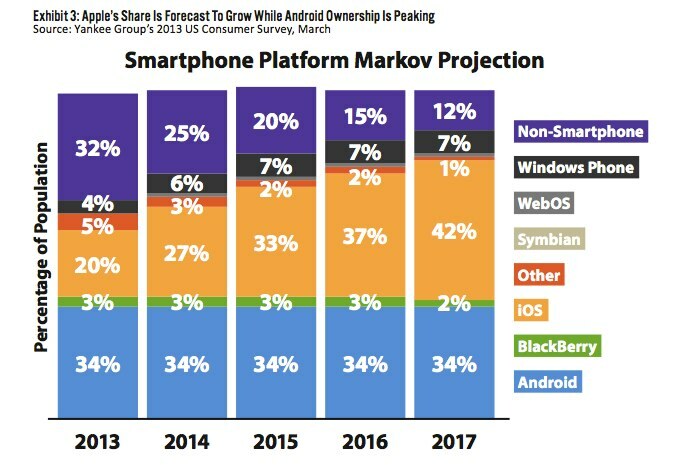 The future is iOS vs. Android. This is the first future projections that I've seen that incorporates actual customer buying plans. Rather than a short sighted quarter to quarter sales numbers that only looks backwards. The Net is Apple share grows (Orange in graph on the right), Android is flat and Microsoft & Blackberry remain pathetic. "91 percent of iPhone owners plan to purchase another iPhone when it's time to upgrade, while for Android the number is just 76 percent. 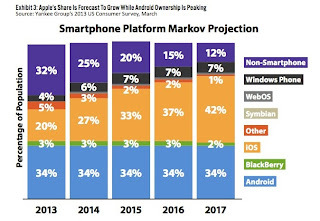 And, three quarters of those looking to switch from Android plan to buy an iPhone." The popular image of the share market is that of secondary market trading. Secondary market transactions take place either through a formally organized "exchange" or through an "over-the-counter" (OTC) network of dealers and brokers.